The Welsh Terrier tends to have a more easygoing manner then the other terrier breeds. It does have some of the standard terrier characteristics though, including an energetic and playful nature. The Welsh Terrier also has a tendency to be self-sufficient, sensitive, and likes to investigate. While slightly calmer which makes it a dependable house pet, it can present the standard challenges of terriers as well. Around strangers and other pets or dogs, the Welsh Terrier may be standoffish. It has a tendency to bark and also to dig. The Welsh Terrier has moderate exercise needs and these can be satisfied and a decent walk or a high-energy play session on a daily basis. It welcomes the opportunity to run outdoors off of the leash, but this should only be done in a secure or fenced in area since it has a natural instinct to hunt. The Welsh Terrier has the ability to survive in an outdoor environment, but does not do well in cold weather. It is best suited in environments where it can live indoors with access to an outside yard. Maintenance of the coat only requires combing every other day or so and shaping every few months. Shaping can be done by clipping, which will soften the coat. The Welsh Terrier may need its ears trained so that they develop correctly into adulthood. There are a few minor health concerns for the Welsh Terrier and they include lens luxation and glaucoma. On occasion, allergies and seizures are seen in this breed as well. It is suggested that the eyes be regularly tested. The average life span of a Welsh Terrier is 12 to 14 years. The Welsh Terrier is one of only two terrier breeds that is native to Wales. It is believed that the breed was derived from the Black and Tan Rough Terrier that enjoyed significant popularity in the eighteenth and nineteenth centuries in Britain. During the late 1700s, a breed known as the Ynysfor existed along with the Otterhounds in Northern Wales. Around the same timeframe, another dog referred to as the Old English Broken Haired Terrier was in existence in the northern region of England. Both the Ynysfor and the Old English Broken Haired Terrier shared very similar characteristics and were often being shown and classified simultaneously as the same breed. Because of this and the fact that both were used in the hunting of several small games, both of them eventually became one breed known as the Welsh Terrier, regardless of what location the individual dog came from. The Welsh Terrier breed became recognized in 1886 by the English Kennel Club, however the early dogs were not able to compete as show dogs due to their rough nature. Breeders wanted to progress the Welsh and tried to do so by using selective breeding and cross breeding with the Wire Fox Terrier breed. The result of these efforts was the development of a Welsh that had the physical appearance of a miniature Airedale Terrier. 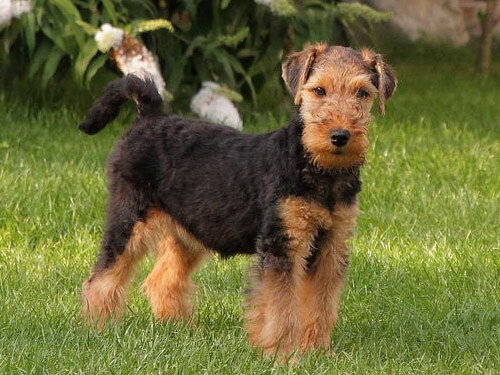 While it has become increasingly competitive in the show ring in recent years, the Welsh Terrier has never gained the success that long-legged terriers have seen in competition.